« Luxury Westside Vancouver Kerrisdale Gardens Homes for Sale > Only 27 Exclusive Kerrisdale Homes available with Riesco & Lapres Interior Design! 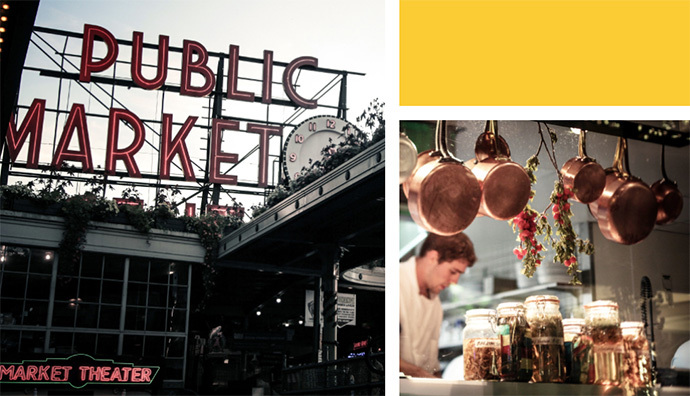 An incredible opportunity for Canadian real estate investors to get into the Seattle property market is now upon us. A new project by BOSA Development will see the construction of 2 high-rise towers in the prime downtown Seattle Belltown real estate district. The presale Seattle Insignia Condos will present a unique ground level opportunity for an affordable downtown condo in this every changing neighbourhood. The Amazon headquarter towers are nearby as is new transit, public transportation, shopping, dining and the best that Seattle has to offer. Great for Vancouver residents, the close proximity to the Seattle Insignia condos give you a ground level opportunity to purchase a presale Belltown condominium which many have compared to the Yaletown district back in the 1990’s when it was redeveloped. The pre-sale Seattle Insignia condo towers are located at 6th Avenue and Blanchard Street Seattle and the expected price point is between $400,000 to $2,000,000 USD. Visit www.insigniabybosa.com for more details. Insignia Seattle condo towers is now well underway and these sophisticated Belltown city homes are unlike anything that Seattle real estate market has seen before. The high-rise Seattle Insignia condo residences will be highlighted by signature interior design, peerless views of the Puget Sound, Lake Union and surrounding mountain ranges and a truly unrivalled amenity collection. All of this city’s most central downtown location – with instant access to the best restaurants, shopping, markets, entertainment and cultural destinations is at your fingertips. The floor plans at this premier residence in Belltown Seattle will include both 1 and 2 bedroom plans with dens in select homes. Many of the homes will have incredible views, some with 360 degree views of the downtown skyline, Puget Sound, Lake Union and the beautiful mountains. The interior design is by award winning Mitchell Freedland. The interior features of the presale Seattle Insignia condos include Bosch stainless steel cooktop, microwave and oven as well as a Bosch integrated dishwasher and Thermador integrated fridge/freezer. The cabinets will be European modern inspired and there are quartz kitchen countertops. The new Insignia Seattle condos will also have engineered hardwood floors and marble or quartz bathroom counters depending on the palette that home buyers choose during presales. As well, there is a Whirlpool washer and dryer included with your purchase and most floor plans allow for walk in closets. All homes will have roof decks or private balconies for outdoor enjoyment and there is on site storage for every homebuyer. The high-rise towers are targeting LEED Silver sustainable design certification. Here are some of the amenities at the master planned Seattle Belltown condo community. Firstly, there is a spectacular 41st floor sky retreat and resident lounge at Insignia by Bosa. There is also a 7th floor open air park terrace that has outdoor grilling BBQ areas (great for entertaining friends and family). Another great on-site amenity at the Insignia Seattle condominiums is the outdoor fire place gathering area and the indoor lap pool and spa, steam room and sauna (which are planned for the North Tower). Another great feature is the fitness atrium with a yoga and pilates studio a screening movie room with entertainment bar and a signature lobby entrance designed by Mitchell Freedland. The presale Seattle Insignia condo towers will also have an outdoor pet retreat in addition to a pet wash and grooming area. There is on site bike storage with work area and retail shops along the pedestrian friendly streets on the ground floor. 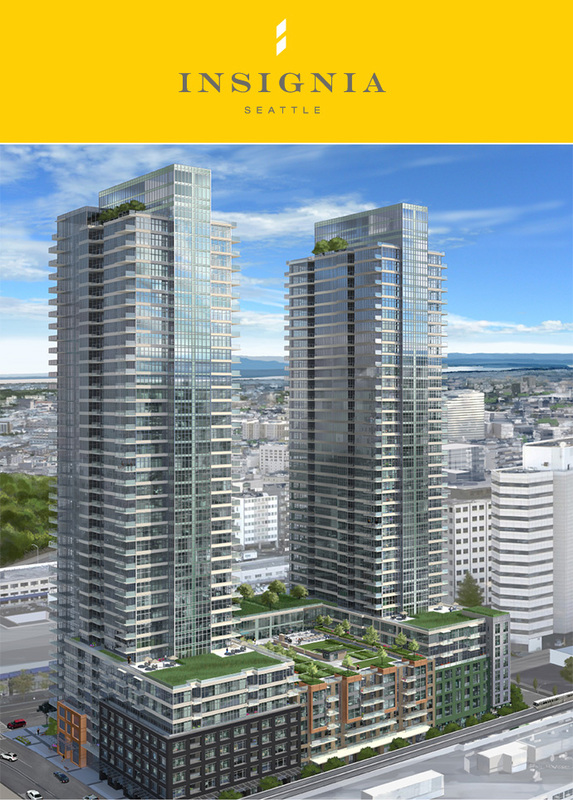 The Seattle Insignia Sales Centre is expected to launch in Fall 2013. Under construction, twin presale Seattle condo towers at Insignia Seattle Belltown real estate development will bring two 41 storey landmark towers to the up-and-coming downtown district. The new Seattle Insignia condo towers will bring more than 700 market unit condominium residences to this amazing neighbourhood. With lots of pent up demand for downtown Seattle Belltown condos and real estate, the presale Seattle Insignia condos will certainly be a hot commodity. Already under construction, the Insignia Seattle condos are brought to you by a Vancouver based real estate developer, Bosa Development.